Introduction to phase ordering kinetics (in gzipped postscript or PDF). I am coordinator of NETADIS, a European Marie Curie network on "Statistical Physics Approaches to Networks Across Disciplines"
I am director of CANES, the EPSRC-funded Centre for Doctoral Training in "Cross-Disciplinary Approaches to Non-Equilibrium Systems"
I am the Statistical Physics section editor for Journal of Physics A.
I am a Deputy Editor of EPL (Europhysics Letters), having been on the Editorial Board of the journal from April 2010 to April 2014 and on the Advisory board from May 2014 to March 2015. I am on the editorial board of Nature Scientific Reports. Applications to network dynamics in biology, focussing on dynamics of subnetworks embedded into larger networks. Applications to econophysics, including segregation phenomena in double auction markets. Rare events in dynamics with non-Gaussian noise and friction. Disorder effects in soft condensed matter: models for the rheology (flow) of "soft glasses" (e.g. dense emulsions, colloidal suspensions, slurries, yogurt, tomato ketchup), effects of polydispersity (distribution of e.g. particle sizes) on phase behaviour. Click here for a final report on previous EPSRC-funded work in this area. Applications to learning and statistical inference (neural networks, Bayesian techniques, Gaussian processes, Support Vector Machines). Enquiries from prospective Ph.D. students who might be interested in working in any of fields listed above are always welcome; the best way to contact me is by email (see above). Suzanne Fielding worked with me from Sep 1997 until Sep 2000 on glassy rheology and driven systems (thesis title: Ageing, driving and effective temperatures: from "soft rheology" to glassy dynamics). She is now a Professor at Durham University, after previous appointments at Leeds and Manchester. Alessandro Speranza did his Ph.D. with me from Oct 1999 until Sep 2002 on the theoretical analysis of phase equilibria in polydisperse liquid crystal systems (thesis title: Effects of length polydispersity in colloidal liquid crystals). He has since worked at a research institute in Florence, affiliated with the mathematics department of the Universita di Firenze, and is now Product Champion PVT Technology at KBC Advanced Technologies. Peter Mayer worked with me from February 2001 until March 2004 on glassy dynamics in kinetic spin models (thesis title: Glassy dynamics and effective temperatures: Exact results for spin-chain models). He has since worked for several years as a postdoc with David Reichman at Columbia University in New York. Moreno Fasolo started in October 2001 and completed his Ph.D. on the effects of polydispersity on the phase behaviour in colloidal systems in October 2004 (thesis title: Polydispersity effects in the phase behaviour of colloidal systems). He has since worked for Pricewaterhouse Coopers in auditing and operational consultancy, and then with Schroders in managing emerging market investments. Alessia Annibale worked with me from Sep 2004 to August 2007; her thesis concerns fluctuation-dissipation relations and heterogeneties in critical coarsening (thesis title: Fluctuation-dissipation relations and heterogeneities in coarsening systems: Insights from exact calculations). She is now a lecturer in the Disordered Systems Group. Adriano Barra started in Jan 2005 and completed his Ph.D. in Jul 2008. His research concentrated on studying mean field spin glasses using exact alternatives to the replica trick (thesis title: Mean field spin glasses: Exact results without the replica trick). He has since been doing research at the Universita di Roma La Sapienza. 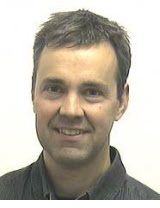 Matthew Ager worked from Oct 2006 to Sept 2010 on a joint EPSRC-funded project with Jibran Yousafzai (who I also co-supervised) and Prof Zoran Cvetkovic in the Centre for Telecommunications Research, on robust phoneme recognition from acoustic waveforms. Matthew went on to works for a market maker company in Ireland. Matthew Urry started his PhD in Feb 2009 and completed in Dec 2012. He worked on learning curves for Gaussian process regression on graphs, and this has resulted in two papers accepted at the prestigious Neural Information Processing Systems conferences, as well as two journal publications. He now works for a software development company. Katy Rubin started in Sept 2010 and worked until Aug 2014 on studying the dynamics of sub-networks of protein interaction networks (PIN) using projection (mode coupling) techniques. Barbara Bravi began her PhD in Sept 2012 and is working on variational and field-theoretic approaches to subsystem dynamics. Aleksandra Aloric started in Oct 2012, on the topic of segregation and co-segregation in interacting agents and markets. Robin Nicole started in Oct 2013 and is working on the effects of agent heterogeneity on market segregation phenomena, and links to mean field game theory. Pablo de Castro began his studies in Jan 2015, in the area of polydisperse phase separation dynamics. Riccardo Margiotta has been working on glassy dynamics on networks since Sept 2015.